This item is a script from the daytime television series "All My Children." It's for show #8542, which was taped on February 3rd and aired on Feburary 21st, 2003. 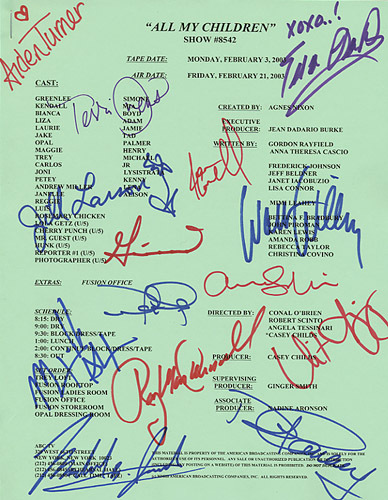 The script is autographed by 14 cast members including Eva Larue Callahan (Maria), David Canary (Adam and Stuart Chandler), Vincent Irizarry (David) Terri Ivens (Simone), Michael B. Jordan (Reggie), Jill Larson (Opal), Ray MacDonnell (Joe Martin), Aiden Turner (Aidan), and Walt Willey (Jack). It comes with a Certificate of Authenticity from the Official Gillian Anderson Website.